A folding car trailer design. Homepage. This page: The perfect accessory for anyone who had occasional need for a small trailer. The "Foldaway" multi-purpose car trailer. Not everyone needs regular use of a compact car trailer, and when out of use, trailers can be tricky things to store. 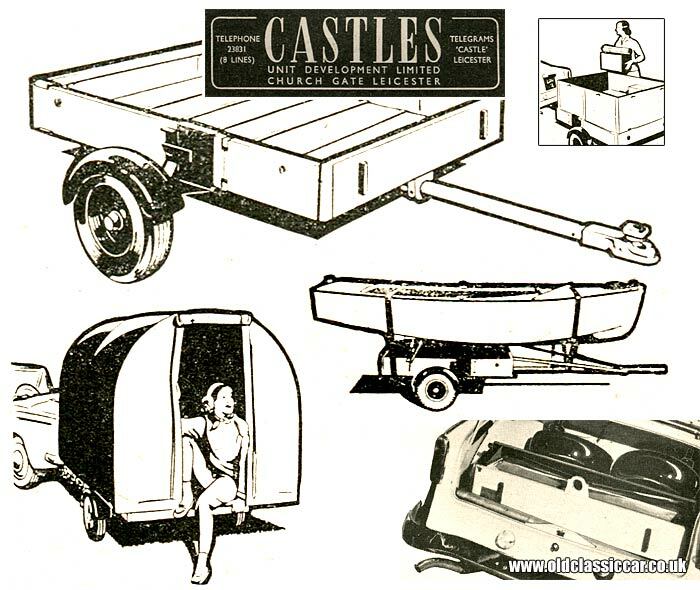 The answer to this dilemma for motorists in the late 1950s and early 1960s was this neat design, called the "Foldaway", a versatile multi-purpose trailer that could be folded away and stored, either in the garage, at the back of the garden shed, or even - as in the illustration below - in the boot of even a modestly-sized vehicle, in this case a classic Hillman Minx (or possibly a Sunbeam Rapier). Who might need such a trailer? Outdoors types for instance, those fond of camping under canvas, could load all their equipment into the car and the trailer, and head off into the hills in search of a remote patch of grass to pitch up at. With the tent in place, the trailer could simply be folded away and hidden somewhere (perhaps in the tent), or inside the car, without the need to find somewhere secure to park it, or having to continue towing it around for the period of the stay. Very handy indeed. The weight of the trailer isn't mentioned, but I'd have thought it would be a two-person lift to get the folded trailer into the boot of one's car. Many businesses might well have taken a long hard look at the "Foldaway" catalogue. A toy store for example could well have had the occasional need to deliver pedal cars to their customers, so the "Foldaway" might come in handy in that scenario. In fact anyone who regularly made one-way trips to deliver moderately bulky items, who didn't want the expense of buying and running a van in addition to a car, might have found a use for this design of trailer. The base price was listed, in 1960, at 70 pounds including a tow bar, so it wasn't the cheapest of trailers admittedly, but it did offer a great deal of flexibility. The illustration shows it in use as a livestock trailer, capable of transporting two sheep, a conventional box trailer, converted to carry a small boat, and even equipped as a folding tent, so something for everyone. According to the maker, it could be erected from scratch in three minutes. Adapters to suit the different uses to which the "Foldaway" could be put, were extra cost options, on top of the basic list price. Do any survive I wonder? It was manufactured by Castles Unit Development Limited, of Church Gate in Leicester. Given that they had eight telephone lines, it must have been a large-ish company at the time. Return to the motoring gadgets, tools & accessories pages at oldclassiccar. If gadgets such as the folding car trailer are of interest, perhaps this page, which looks at the circa 1930 Deloford Portable Safety Boat - designed to fold away and fit onto a small car's luggage rack - will also be of interest. For tips on towing in general, please see this page.